Theoretically speaking, this is possible but, realistically, it is highly improbable. Despite his bombastic rhetoric, Duterte is not "pivoting" away from America. Like other Southeast Asian leaders, Duterte is only trying to rebalance his foreign policy via hedging. Since the US-China power competition is still ongoing and neither is posing an existential threat to smaller states in the region, it is unsurprising that the Philippines and Vietnam have tried to rebalance their foreign policies and pursue a hedging strategy. There are two main reasons why the “Asian pivot” of Duterte and, some anticipate, other leaders in the region is only a myth. First, Southeast Asian countries, especially Vietnam, understand that leaning to one side carries profound risk. Second, although the ties between China and ASEAN countries have developed immensely over the past ten years, serious territorial disputes remain. Furthermore, China’s increasingly muscular foreign policy can pose a threat to the security of many countries in the region. Thus, it is unlikely that small Asian states would be willing to bandwagon with China at the expense of their long-term security. Asia has long posed a major puzzle for balance of power theories because most Asian states have not made serious attempts to balance against the United States for decades, even though it has been the most powerful actor in the region since 1945. Neither have they flocked to the US side as it became increasingly clear that China was rising and had hegemonic ambitions. It seems clear that Asian states prefer engaging with both superpowers while not getting too close to either. This is the essence of a hedging strategy. In the context of the current Sino-US competition, hedging among Asian states should not be surprising at all. In fact, hedging is the most rational strategy for small states to pursue if they want to survive in an anarchic system. When faced with only one superpower, it makes sense for small states to cooperate with the superpower, unless their physical existence is being threatened. When faced with two superpowers, small states should obviously partner with the one that is less of a threat to their security. When neither superpower poses an existential threat and the two remain engaged in a power contest, small states should choose to align themselves with the likely victor. However, when the outcome of the contest is highly uncertain, and it is clear that the weaker power might pose more of a security threat in the long term while the stronger power might be less threatening, it is best for small states to hedge their bets. For small states, hedging in this situation is rational for several reasons. First, because neither superpower is posing an immediate and direct threat to their homeland security, they can delay their alignment decision and reap the benefits of engagement in the meantime. Second, since the outcome of the superpower contest is still uncertain, it makes little sense for small states to prematurely lean to one side because they would have to forego the benefits of engagement with one superpower. Lastly, because the outcome of the superpower contest remains uncertain, the longer small states can delay their alignment decision the better because as time passes, the outcome of the contest will be more obvious, thereby allowing for a more accurate alignment decision. In contrast, if a small state decides to align prematurely and the superpower it aligns with happens to be defeated, the outcome could be disastrous. Thus, in a fairly secure but highly uncertain environment, small states should pursue a hedging strategy. While it may appear that Vietnam is pivoting toward the United States while the Philippines is pivoting toward China, this would be an incorrect reading of their behavior. In reality, both have been pursuing a hedging strategy, albeit from opposite directions. Vietnam has been slowly but surely moving away from its traditionally close relationship with China toward warmer ties with the United States. In contrast, the Philippines under Duterte realizes that direct confrontation with China probably would not allow it to resolve the current territorial disputes. Thus, it has tried to distance itself somewhat from the United States while boosting ties with China. The case of Vietnam is essentially the same. Vietnam’s soft approach to China might be expected given its deeply entangled economic dependency on China. Two months after the tribunal decision, Vietnamese leaders sought to deepen engagements with China with an official visit by Prime Minister Nguyen Xuan Phuc from September 10 to 15, 2016. It was also Phuc’s first trip to China since he assumed office in April 2016, and the first visit made by a Vietnamese Politburo member to China since the 12th Vietnam Communist Party’s National Congress, which was held in January 2016. The trip reaffirmed the importance of the Sino-Vietnamese relationship with Vietnam attempting to maintain the status quo vis-a-vis China as its top priority. It is not difficult to understand why China is always on the top of Vietnam’s agenda. According to the Chinese statistics, China was Vietnam’s biggest trading partner with a total of approximately USD 96 billion in 2015, eclipsing other partners. The United States was Vietnam’s second largest partner with a total in goods reaching around USD 45 billion in 2015.2 Along with discussions on bilateral trade, Phuc also discussed with his Chinese counterpart political and security cooperation and South China Sea issues, among other topics. The two countries vowed to maintain peace and stability in the South China Sea, but no concrete details about their evaluations of The Hague’s July arbitration were released. Of course, having good relations with China does not mean that Vietnam is not simultaneously cultivating closer relations with other countries. Against the backdrop of what appears to be the Philippines deeply leaning toward China after Duterte’s historic visit to Beijing, Standing Secretary of the Central Committee Secretariat of the Communist Party of Vietnam Dinh The Huynh visited China for three days from October 19 to 21.3 Some analysts interpreted this as a sign that Hanoi will continue to place greater emphasis on maintaining stable, if not cordial, ties with its giant neighbor, despite their intensified jostling in the South China Sea. Upon closer inspection, however, it becomes clear that the trip to Beijing was largely designed as a “shock absorber” to offset the strategic fallout from Huynh’s visit to Washington. Should Huynh have made substantial concessions to China on the South China Sea, he would doubtlessly have isolated himself, especially in the circumstance that the mid-term National Party Congress is going to take place next year. Right after his visit to China, he visited the United States from October 23 to 30, more than doubling the length of his trip to China. It is puzzling that Huynh’s visit came right before the US presidential election in November. His trip was bound to be eclipsed by American attention to local politics. However, the trip was significant in the sense that it is indicative of Vietnam’s efforts to strike a balance between China and the United States. As of now, it is still unclear what Duterte meant when he announced that the Philippines would "separate" from the United States and "align" with China, but it is extremely unlikely that he would forsake the alliance with the United States in favor of a closer partnership with China. Even so, because this scenario could materialize and would have significant geopolitical consequences, it still merits close analysis. Assuming that the Philippines is not hedging like Vietnam but actually pivoting away from the United States, how far could the nascent partnership between China and the Philippines go? There are strong grounds to believe that no matter how close the relationship becomes, a formal military alliance between China and the Philippines would be out of the question for the foreseeable future. First, Duterte himself explicitly ruled out this possibility on his recent trip to Japan,4 as he said that his visit to China was purely about economics, and both sides avoided talking about military alliances. Second, because a decision to enter into a formal military alliance with China would no doubt represent a sharp change in Philippine security policy, it is likely to be fiercely resisted by many in the Philippine government, especially the Philippine military, which has long benefitted from a close defense partnership with the United States. Lastly, because a Sino-Philippine alliance would directly harm US security interests in Asia, it would meet strong US resistance and even retaliation. If this happened, while the Philippines might gain territorial concessions in the South China Sea, it is highly likely that its overall position would be worsened. Therefore, even if we fully discount Duterte’s public announcements, it is still possible to argue with high confidence that the Philippines would not go for a military alliance with China. Leaders do not always behave rationally and might miscalculate in a highly uncertain strategic environment. We can imagine a scenario in which Duterte would seek an alliance with China in the hope that he could somehow play two superpowers off against each other and reap benefits from a close relationship with both. However, it is highly unlikely that China would accept an alliance with the Philippines under any circumstance. 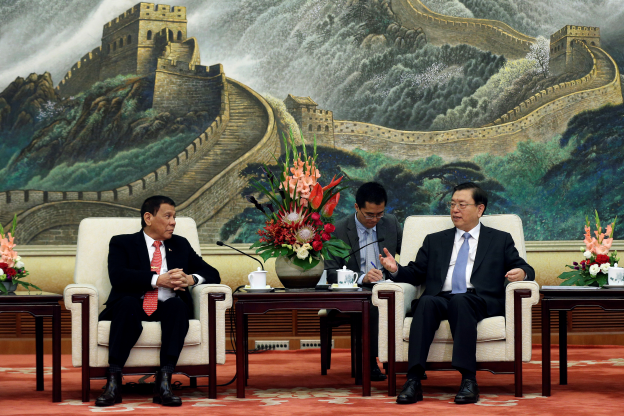 From Beijing’s perspective, it would be unclear whether an ally like the Philippines would be an asset or a liability. First, because the Philippines is not known for having a powerful army, it is unclear how much support it could provide when Beijing truly needed military assistance. Second, if the Philippines did in fact abandon its US ally so readily, how long would it take for Manila to break an alliance with China? China would definitely think twice before entering into an alliance with the Philippines if it sees its potential ally as fickle. Lastly, an alliance always carries a real risk of entrapment, no matter how low. For all of its problems, the last thing that China needs is another ally like North Korea. Indeed, Chinese security strategy has never been predicated on a web of alliances like that of the United States. The only peacetime alliance that Beijing currently honors is with Pyongyang and only because allowing North Korea to collapse would, it is assumed, directly and massively destabilize China’s security environment. Together, these reasons suggest that it would be an extremely unwise move for Beijing to seek a military alliance with Manila. As we argued elsewhere, while Beijing and Hanoi cooperate where they can, there has also been a deepening sense of struggle in this relationship. The context has shifted to what is aptly called “struggling co-evolution,” as the two countries are continuously searching for a “glue” to keep their relations together for both their international and domestic affairs.5 Vietnam has engaged in a systematic set of policies to protect its national interests in the South China Sea. The Vietnamese government has sought to strengthen relations with China as well as with non-claimant stakeholders such as India, France, the United States, and rival claimants within ASEAN, in order to find a balance between great powers and perceived interests. Compared to the credit line of USD 100 million two years ago, this signing was a giant step. Both sides refrained from providing details on the objects for which the USD 500 million is intended, but the best arms shopping list for Vietnam might be fast patrol vessels and missile systems to guard its long coast and vast 200-mile exclusive economic zones (EEZs). India is the country that Vietnam could approach for Brahmos missiles as well as training services for its six Kilo-class submarine crews. In addition, closer defense cooperation with India might be a viable alternative to Russia, in case the latter stops its sale of advanced weapons to Vietnam in favor of of its strategic partnership with China. Duterte’s anti-American sentiments are genuine, and there is no doubt that they have found some expression in his foreign policy. However, it would be incorrect to ascribe all of the changes to Duterte. China’s growing assertiveness in the South China Sea since 2009 has sparked a debate within ASEAN policy circles on the question of the rising power’s ultimate intentions and how to appropriately deal with it. Southeast Asian countries have not only denied or not officially accepted the Chinese leadership, but also called for other outside powers or partners not directly involved in the disputed issues (e.g. territory or sea disputes between China and Southeast Asian countries) to take a leading role. It is rational for small states to pursue a policy of hedging when caught in a superpower struggle. Equidistance from both superpowers is the equilibrium state of affairs. Hedging will continue to be the regional norm; it is superior as a strategy for small states to survive in this highly uncertain environment. Even if the Philippines deviated from this course, there is no reason why others should follow suit. 1. “How Many US Allies Can China Turn?” ChinaFile, October 25, 2016, http://www.chinafile.com/conversation/how-many-us-allies-can-china-turn. 2. “Viet Nam- Trung Quoc ra Thông Cáo chung,” Website Chính Phu, September 14, 2016, http://thutuong.chinhphu.vn/Home/Viet-NamTrung-Quoc-ra-Thong-cao-chung/20169/25378.vgp. 3. VOV, “Chu tich Trung Quoc Tap Can Bình tiep đong chí Đinh The Huynh,” VOV, October 20, 2016, http://vov.vn/chinh-tri/chu-tich-trung-quoc-tap-can-binh-tiep-dong-chi-dinh-the-huynh-561889.vov. 4. The Phil star, “Duterte assures Tokyo: No military alliance with China,” October 27, 2016, http://www.philstar.com/headlines/2016/10/27/1637789/duterte-assures-tokyo-no-military-alliance-china. 5. Truong-Minh Vu, “The Politics of ‘Struggling Co-evolution’: Trade, Power, and Vision in Vietnam’s Relations with China,“ The Asan Forum, Vol. 3, No. 4 (2015). 6. DNA, “India & Vietnam sign 12 agreements; Modi offers US $500 Mn credit line for defence cooperation,” dnaindiana, September 3, 2016, http://www.dnaindia.com/india/live-pm-modi-in-vietnam-hanoi-nguyen-xuan-phuc-defence-tran-dai-quang-trade-oil-exploration-bilateral-talks-2251440. 7. Sanghamitra Sarma, “India-Vietnam Relations After Modi’s Visit,” The Diplomat, September 05, 2016, http://thediplomat.com/2016/09/india-vietnam-relations-after-modis-visit/. 8. Tuoitre News, “France to support Vietnam’s sovereignty over waters, airspace: Hollande,” Tuoitre News, September 7, 2016, http://tuoitrenews.vn/politics/36898/france-supports-vietnams-sovereignty-over-waters-airspace.